As an art museum educator, I live for the tales of visitors who have had meaningful, inspirational, life-changing experiences in museums—perhaps because it was exactly this kind of personal experience that propelled me down the career path I’ve taken. Working in the Center for Creative Connections (C3), a participatory educational space for visitors of all ages, I have the privilege of hearing these kinds of statements often; however, a few months back I was surprised to hear from a visitor who literally found herself in a photograph by Geoff Winningham currently on view in the C3. During a Late Night event, Laura was walking through C3 with her husband when they both stopped dead in their tracks as they walked by the photograph. “I think that’s you,” her husband stated. “I know it’s me!” Laura exclaimed. I had so many questions for her. What was it like seeing yourself in a work of art in a museum? Did you know this photograph existed or that you were being photographed at the time? Can you recall the other cheerleaders in the photograph? Luckily, Laura was happy to meet up to discuss her experience. As you might imagine, Laura was quite surprised to see a photo of her college-age self in the Museum. As a University of Texas cheerleader, she was aware they were photographed in action from time to time—once her image ended up as part of the opening montage of ABC’s Wide World of Sports for a full year—but she never imagined she would make it into a work of art in the DMA’s collection. Laura is uniquely well versed in the DMA collection, but until recently she had never seen this photograph before. Not only is Laura a DMA Member, but she was also part of the PM Docent class for five years, starting with the charter class under the leadership of Gail Davitt. Both the University of Texas and the Dallas Museum of Art have loomed large in Laura’s life, but she never imagined that the two worlds would collide. 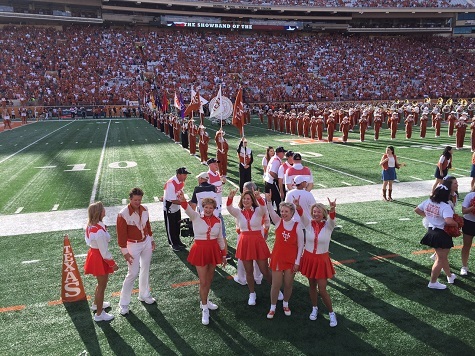 In fact, UT Cheer isn’t just a distant memory as Laura regularly attends the Cheer Reunions and keeps in touch with fellow cheerleaders, including some of those captured alongside her in Winningham’s photograph. 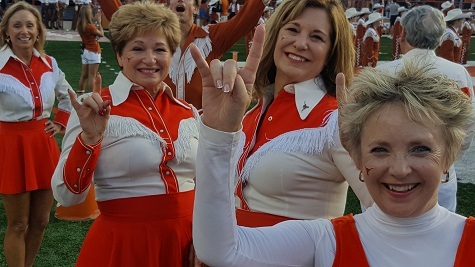 In the image below, the woman on the far right is the same woman on the far left of the UT Cheerleaders photograph by Winningham. Now that Laura knows of the existence of this photograph, she comes back to visit it from time to time. She was also keen to meet the photographer, Geoff Winningham, and looked him up immediately to learn more about him and his work. Fortunately, Winningham was at the DMA in April to lead a Gallery Talk about the series this photograph is part of—A Texas Dozen. What a really wonderful happenstance!